Spain’s five-star La Manga Club has the ideal solution for ladies looking to celebrate a special event in style this spring and summer with the launch of the resort’s new ‘Spring ‘n’ Tonic’ package. 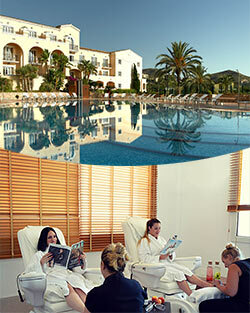 Perfect for a spa break, hen weekend or birthday celebration, the three-night bed-and-breakfast breaks feature an array of attractive benefits to help women relax and have fun in the Spanish sun, with prices starting from just €210 per person (approx £180). Bookable until the end of December (apart from July and August), the packages, for groups of four people, include a welcome bottle of Cava on arrival and one 60-minute spa treatment per person, to be taken from a range of options including manicure and pedicure, facial or body massage. In addition, guests will be treated to a free cocktail every time they dine at one of La Manga Club’s official restaurants – Amapola, Luigi, Asia and La Bodega – as well as enjoying complimentary use of the resort’s Wellness Centre and fitness centre, indoor pool, saunas and steam rooms. One-hour beauty masterclasses are also available to book for €13 per person, while lovers of the finer things in life can indulge in one of the great British customs during their stay with La Manga Club’s recently-launched ‘Traditional Afternoon Tea’ service. A selection of delicious finger sandwiches, sweet treats and sumptuous scones with strawberry jam and cream are all on offer daily at the Piano Bar from 3.30-6.00pm, with afternoon tea accompanied by a wide choice of teas or coffee. A refreshing glass of cava is also included in the price of €12 per person (bookable in advance for a minimum of two people). Prices are based on four people sharing a two-bedroom apartment in the resort’s well-appointed Las Lomas Village accommodation. The official overseas training base of the Lawn Tennis Association (LTA, the resort’s extensive facilities include three 18-hole golf courses, a 28-court tennis centre and a 2,000 sqm Wellness Centre. In addition, it features the choice of a five-star hotel, four-star serviced apartments and townhouses and more than 15 bars and restaurants. For more information on La Manga Club and to book the new ‘Spring ‘n’Tonic’ package, email reserve@lamangaclub.com or phone 00 034 968 33 1234. Located in a magnificent natural environment next to Calblanque National Park and the Mediterranean Sea, with a mild year-round climate and enjoying exceptional security and privacy, the exclusive resort of La Manga Club (Los Belones, Cartagena, Murcia) offers luxury, leisure and sport in the same place, and is set just 20 minutes from Murcia airport, a 30-minute drive from the city’s new Corvera airport – which opened in January 2019 – and is an hour away from Alicante. Founded in 1972, the resort now covers an area of 566 hectares containing accommodation, professional sports facilities, relaxation zones, first-class real estate and a private community of 2,300 residents, in a region which boasts more than 350 days’ of sun and is surrounded by natural parks and untouched beaches. • High-resolution images of La Manga Club may be downloaded for editorial purposes from here.